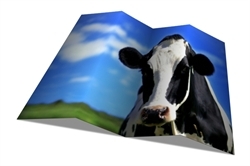 The Photofold effect allows you to fold your photograph. This option allows you to change the fold count. Min = 0, Max = 100, Default = 4. Use this option to change the fold size as a percentage of the image height. Min = 0, Max = 100, Default = 10. This option allows you to draw a shadow.